Over this year, a few of us at UCL have been getting increasingly interested in the Lyman alpha forest. It’s a unique probe of how gas is distributed through the universe, made possible by analysing the light from distant, bright quasars. 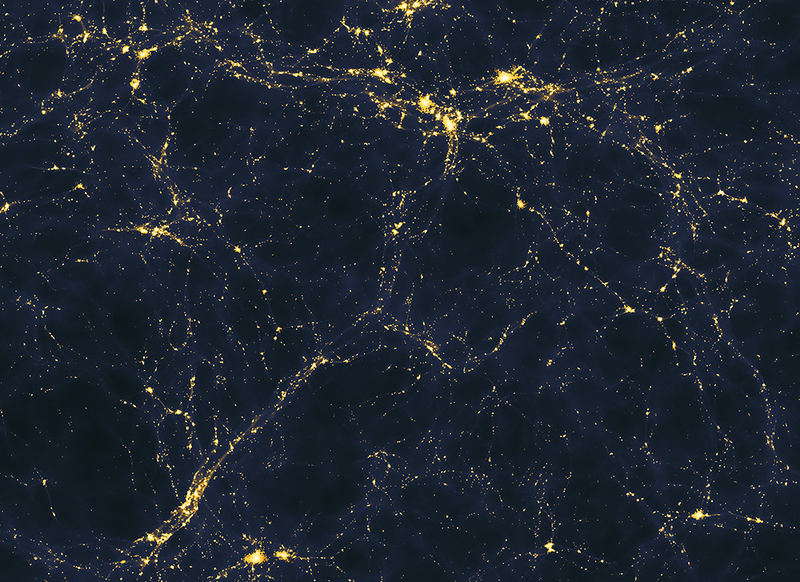 While a lot of emphasis has been placed on the ability of the distribution of gas to tell us about dark energy, we’ve been making the case that there’s more information lurking in the raw data — more here in UCL’s official press release and blog. For press purposes our work has been illustrated by a picture from an ongoing computer simulation. But actually, one of the neatest aspects of this work is that it can be done with pencil and paper. We’ve built a rigorous framework to study how light propagates through the large-scale universe, without running a conventional simulation. Over the coming months and years we hope to build on that framework to study more about how the large scale universe is reshaped by the light streaming through it. Neutrinos: cosmic concordance or contradiction? 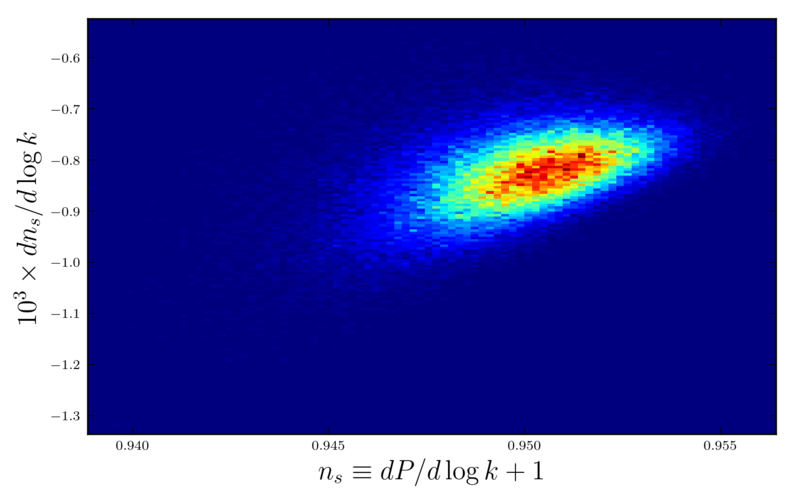 Our recent paper on possible new physics in the neutrino sector from cosmological data has been selected as an Editor’s Suggestion in Physical Review Letters! The work was discussed in comprehensive blog posts at phys.org and on the UCL Science Blog; a recent guest post on the topic at Early Universe @UCL is here. Is the universe a bubble? Let’s check! The Perimeter Institute did a major press release on our new work in simulating bubble collisions in eternal inflation in full General Relativity. The accompanying video has garnered over 100k views on YouTube! The story was covered in phys.org and IFLScience. A guest post on this topic was previously featured on Early Universe @UCL. The cosmological principle says that our universe looks the same regardless of where we are or in which direction we look. Obviously, a universe that exactly satisfies this principle is unimaginably boring, precisely because we wouldn’t be here to imagine it. In fact, a quick measurement using my bathroom scale and a tape measure suggests that I have a density around 1100 kg/m3, which is 1030 times larger than the cosmological average. Clearly, the universe is homogeneous and isotropic only when averaged over large-enough scales. So, where do the local differences in density come from? Enter inflation. This is a class of theories that uses the inherent randomness of quantum perturbations to generate local fluctuations in the dominant energy component of the primordial universe: hypothesized quantum fields with no intrinsic spin. Fields of this type are called scalars and show up often in physics: phonons in solid state physics are scalars, as is the recently discovered Higgs boson. The random fluctuations in these scalar fields cause small changes in the spacetime curvature, collecting dark matter and baryons into regions of space which eventually collapse into galaxies, stars, and people. Although the local curvature perturbations are random, not all randomness is equal. The different possible variances of the random curvature perturbations are distinguishable through the shape of the acoustic peaks in the angular power spectrum of the cosmic microwave background (CMB). For example, if the perturbations were pure Gaussian white noise, then there would be more power on smaller angular scales than has been seen by the WMAP and Planck satellites. This simple type of randomness has now been eliminated at a level greater than 5 sigma. Interestingly, inflation predicts a small, but non-negligible deviation from white Gaussian noise, which is exactly what we see. However, the amount and type of this deviation depends on the way the scalar field theory is constructed — and there are lots of ways to make scalar field theories. If there is only one scalar field, there is usually only one way to inflate: one field using its potential energy to drive the universe’s expansion, which in turn acts as a frictional force to stop the field from gaining too much momentum. This causes a runaway effect where the expansion becomes progressively faster, sustaining inflation for an extended period of time. Since single-field models depend only on the potential energy of one field, for every potential energy function there is usually a unique prediction for the statistics of the CMB. 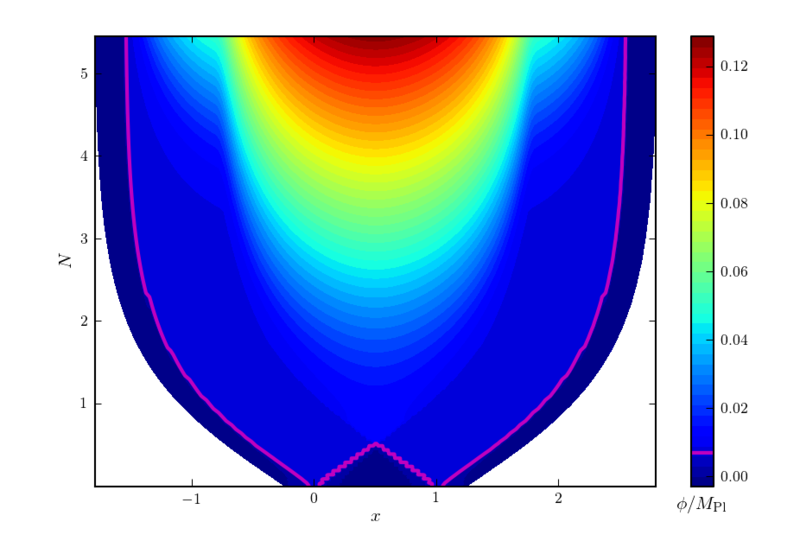 This shows the scalar field potential energy density V as a function of one field (left) or two fields (right). The red dots indicate some possible initial positions for the fields, while the black lines show the paths the fields would take during inflation. With one field you can only go one way down the potential; all initial conditions give the same outcome. With more than one field the paths are different for different initial conditions and each of these predict slightly different statistics for the CMB. However, fundamental particle physics theories, like string theory or supersymmetry, often have hundreds or thousands of scalar fields. Since these theories become most relevant at energy scales close to the inflationary energy scale, there is considerable interest in analyzing their dynamics. This certainly complicates things. Multifield models have not only one, but usually an infinite number of ways to inflate. The potential energy that drives inflation can now be distributed across any combination of the fields and this distribution of energy changes during the inflationary period in complicated ways that depend on the fields’ initial conditions. The dynamics can even be chaotic! With so many more degrees of freedom, multifield models give a much wider range of possible universes. Understanding whether or not our universe fits into this spectrum is obviously a big challenge! To determine the predictions of multifield models it is therefore useful to employ a numerical approach that can handle their increased complexity. Over a few visits back-and-forth between London and Auckland, my collaborators and I have built an efficient numerical engine that can solve the exact equations describing the inhomogeneous perturbations. The speed of the code has allowed us to calculate statistics for models with over 200 scalar fields — many more than previously possible. Perhaps surprisingly, our calculations indicate that the most likely predictions of the multifield models are bunched tightly around tiny regions of parameter space and are not sensitively dependent on the initial conditions of the fields. This is a 2D histogram where blue and red indicate less-likely and more-likely regions, respectively. We have used 100 fields to drive inflation and have looked at 100,000 different initial conditions. But first, some basics: simple inflation models predict density perturbations that are random and the density’s modes at a given physical scale, or wavenumber k, are drawn from a Gaussian probability distribution with a variance equal to the primordial power spectrum P(k). A perfect white noise spectrum has P=constant. So, I have plotted here the first and second derivatives of P with respect to the logarithm of k. Although the possibilities for this multifield model are widely varied, the vast majority of our results are grouped tightly together, indicating that the initial conditions are less important than one might expect. This is important because, in order to calculate how much the observations favor a given model, we need to sample the entire relevant portion of the model’s parameter space and weight each combination of parameters according to how well they fit our CMB observations. This process is computationally difficult, so if we can argue that the fields’ initial conditions only weakly affect the model’s predictions, then it allows us to use a smaller sample, greatly simplifying the calculation. The end-goal of this line of research is to know which animal in the zoo of inflation models, if any, gives the best description of our universe. For each of these models we must individually calculate the probability that the model is true given the data we have extracted from the CMB — in Bayesian statistics this is known as the posterior probability for the model. By taking the ratio of two models’ posterior probabilities we can determine which model we should bet on being the better description of nature. While we still have more work to do before we can calculate which multifield inflation model is best, we now have many efficient tools in place. There will be much more to come soon! 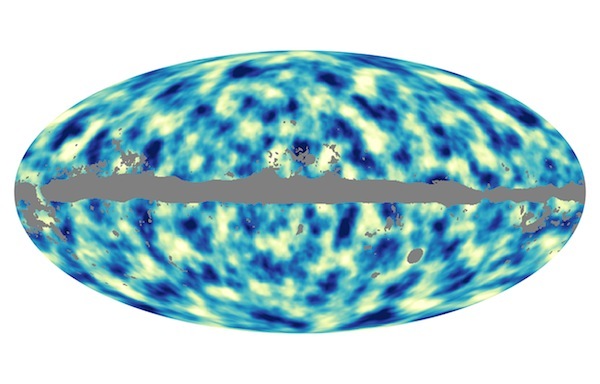 The scientists working on Planck have been awarded a Physics World Top 10 breakthrough of 2013 “for making the most precise measurement ever of the cosmic microwave background radiation”. 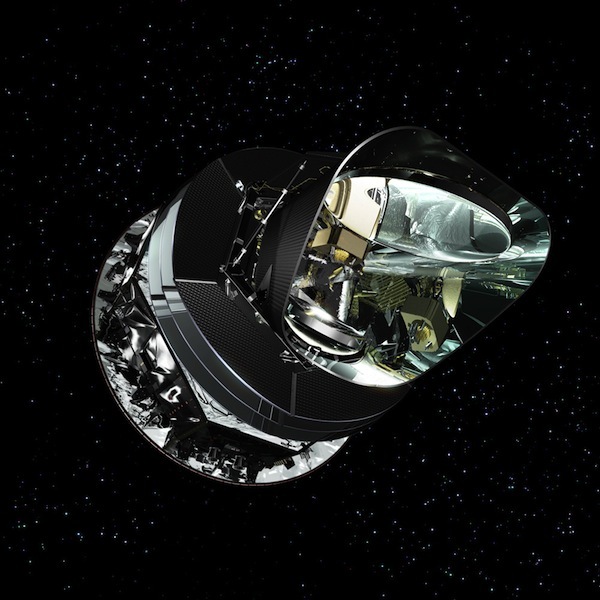 The European Space Agency’s Planck satellite is the first European mission to study the origins of the universe. It surveyed the microwave sky from 2009 to 2013, measuring the cosmic microwave background (CMB), the afterglow of the Big Bang, and the emission from gas and dust in our own Milky Way galaxy. The satellite performed flawlessly, yielding a dramatic improvement in resolution, sensitivity, and frequency coverage over the previous state-of-the-art full sky CMB dataset, from NASA’s Wilkinson Microwave Anisotropy Probe. The first cosmology data from Planck was released in March 2013, containing results ranging from a definitive picture of the primordial fluctuations present in the CMB temperature, to a new understanding of the constituents of our Galaxy. These results are due to the extensive efforts of hundreds of scientists in the international Planck Collaboration. Here we focus on critical contributions made at UCL to these results. Planck’s detectors can measure temperature differences of millionths of a degree. To achieve this, some of Planck‘s detectors must be cooled to about one-tenth of a degree above absolute zero – colder than anything in nature – so that their own heat does not swamp the signal from the sky. Giorgio Savini spent the five years prior to launch building the cold lenses as well as testing and selecting all the other optical components which constitute the “eyes” of the Planck High Frequency Instrument. During the first few months of the mission he helped to analyze the data to make sure that the measurements taken in space and the calibration data on the ground were consistent. UCL researchers Hiranya Peiris, Jason McEwen, Aurélien Benoit-Lévy and Franz Elsner played key roles in using the Planck cosmological data to understand the origin of cosmic structure in the early universe, the global geometry and isotropy of the universe, and the mass distribution of the universe as traced by lensing of the CMB. As a result of Planck’s 50 megapixel map of the CMB, our baby picture of the Universe has sharpened, allowing the measurement of the parameters of the cosmological model to percent precision. As an example, Planck has measured the age of the universe, 13.85 billion years, to half per-cent precision. The precision of the measurements has also allowed us to rewind the story of the Universe back to just a fraction of a second after the Big Bang. At that time, at energies about a trillion times higher than produced by the Large Hadron Collider at CERN, all the structure in the Universe is thought to have been seeded by the quantum fluctuations of a so-called scalar field, the inflaton. This theory of inflation predicts that the power in the CMB fluctuations should be distributed as a function of wavelength in a certain way. For the first time, Planck has detected, with very high precision, that the Universe has slightly more power on large scales compared with small scales – the cosmic symphony is very slightly bass-heavy, yielding a key clue to the origin of structure in the Universe. Inflation also predicts that the CMB fluctuations will have the statistical properties of a Gaussian distribution. Planck has verified this prediction to one part in 10,000 – this is the most precise measurement we have in cosmology. As the CMB photons travel towards us their paths get very slightly bent by massive cosmological structures, like clusters of galaxies, that they have encountered on the way. This effect, where the intervening (dark) matter acts like a lens – only caused by gravity, not glass – on the photons, slightly distorts the CMB. 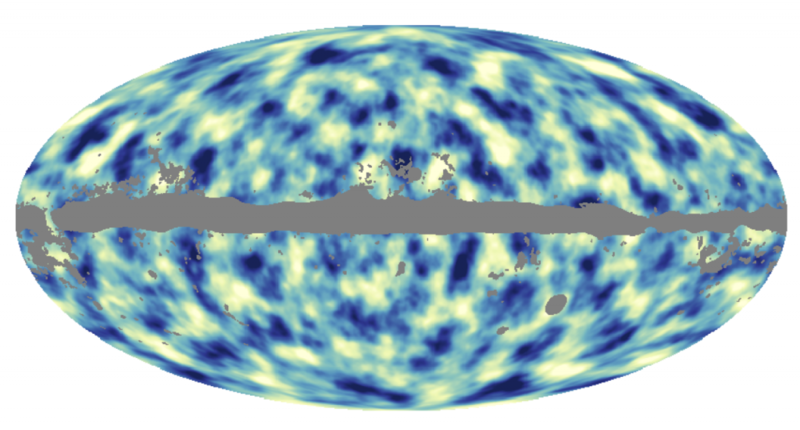 The Planck team was able to analyse these distortions, extract the lensing signature in the data, and create the first full-sky map of the entire matter distribution in our Universe, through 13 billion years of cosmic time. A new window on the cosmos has been opened up. Einstein’s theory of general relativity tells us about the local curvature of space-time but it cannot tell us about the global topology of the Universe. It is possible that our Universe might have a non-trivial global topology, wrapping around itself in a complex configuration. It is also possible that our Universe might not be isotropic, i.e., the same in all directions. The exquisite precision of Planck data allowed us to put such fundamental assumptions to the test. The Planck team concluded that our Universe must be close to the standard topology and geometry, placing tight constraints on the size of any non-trivial topology; some intriguing anomalies remain at the largest observable scales, requiring intense analysis in the future. Aside from additional temperature data not included in the first year results, the upcoming Planck data release in summer 2014 will also include high resolution full-sky polarization maps. This additional information will not only allow us to improve our measurements of the cosmological parameters even further; it will also advance our understanding of our own Galaxy by probing the structure of its magnetic fields and the distribution and composition of dust molecules. There is a further, exciting possibility: if inflation happened, the structure of space should be ringing with primordial gravitational waves, which can be detected in the polarized light of the CMB. We may be able to detect these in the Planck polarization data. As usual, this time of year is a very busy one for EarlyUniverse @ UCL, with several departures and new arrivals! We bid a fond farewell to Dr Stephen Feeney, who moves to Imperial College London to work with Andrew Jaffe. Stephen’s thesis, titled “Novel Algorithms for Early Universe Cosmology”, won the Jon Darius Memorial Prize at UCL recently. Stephen Feeney and Hiranya Peiris at Stephen’s PhD graduation. We also say goodbye to Dr Jonny Frazer, who spent a short but highly productive time as a postdoc at UCL. Several exciting papers are in the pipeline from his time at UCL, and we will be blogging about this work in coming months. Jonny moves to the theory group at Bilbao, Spain, where he will be honing his kite-surfing skills inbetween doing physics! Jason McEwen’s leaving do and new faculty position celebration. Dr Jason McEwen has just moved as a Lecturer to our sister department, the Mullard Space Science Laboratory at UCL. Fortunately, he will still be blogging for us! 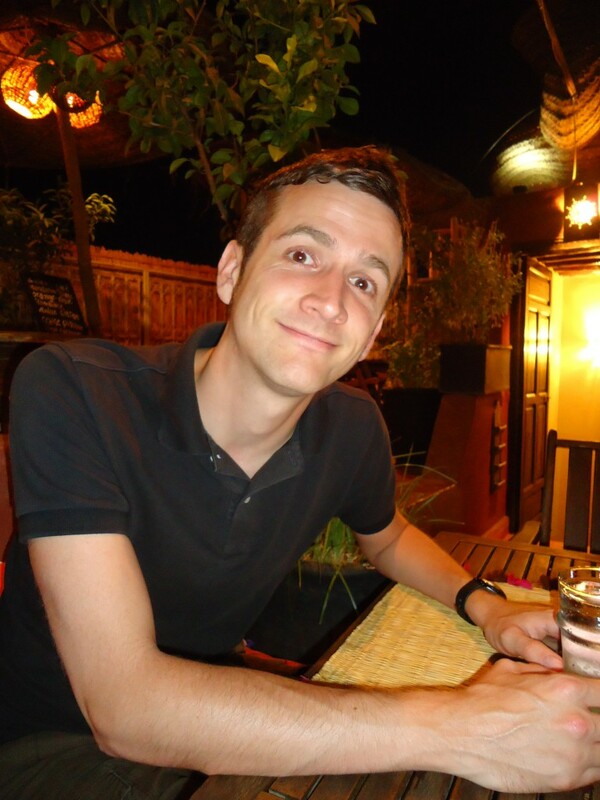 We also welcome Dr Andrew Pontzen, a brand-new Lecturer at UCL Physics and Astronomy. Last but not least, we are very excited to have three new postdocs on board: Drs Franz Elsner, Marc Manera, and Nina Roth, as well as new PhD student Daniela Saadeh. We are looking forward to their upcoming blog posts! Keeping up our tradition at this time of year, a few members of EarlyUniverse @ UCL got together for a Halloween pumpkin-carving party. Here is their handiwork! This blog post was written by Aurélien Benoit-Lévy. 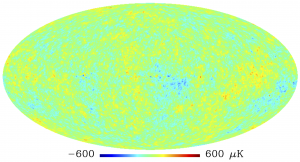 There’s a lot of activity on this blog about the cosmic microwave background (CMB) and Planck, and on how much Planck has improved our view of the baby universe compared to its predecessors WMAP and COBE. One of the things that have drastically improved between those satellites is the angular resolution. This simply means that Planck is able to see finer details in the CMB and is therefore able to extract more cosmological information. 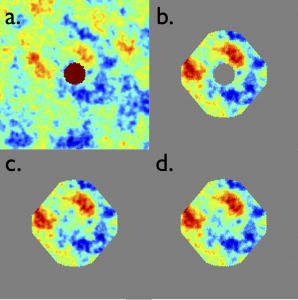 However, getting the physical sense of a finite resolution instrument is not always easy, especially since we don’t know what the CMB fluctuations should look like. That’s why we can use a familiar object and play around with the resolution parameter. So let’s consider our planet Earth, which indeed we know quite well! Full resolution map, given by the resolution of the initial data of about 1 arc-minute. The following animation shows the Earth as seen first by a very basic satellite that would only be sensitive to structure at the scale of 180 degrees. At this scale, the only thing we can see is the average altitude of the Earth, and that is why the animation starts with a monotonic blue map. The resolution can therefore be thought of as the scale at which details are smoothed and cannot be easily discerned. Then the resolution increases (i.e., the smallest visible altitude decreases, I know that’s confusing), and we see the highest regions of the Earth coming into view one by one: first the Himalayas, and then the Antarctic, and all the other mountains. At the COBE resolution (7 degrees) we can distinguish the large continents, but we cannot resolve finer details like the South-East Asian Islands or Japan. 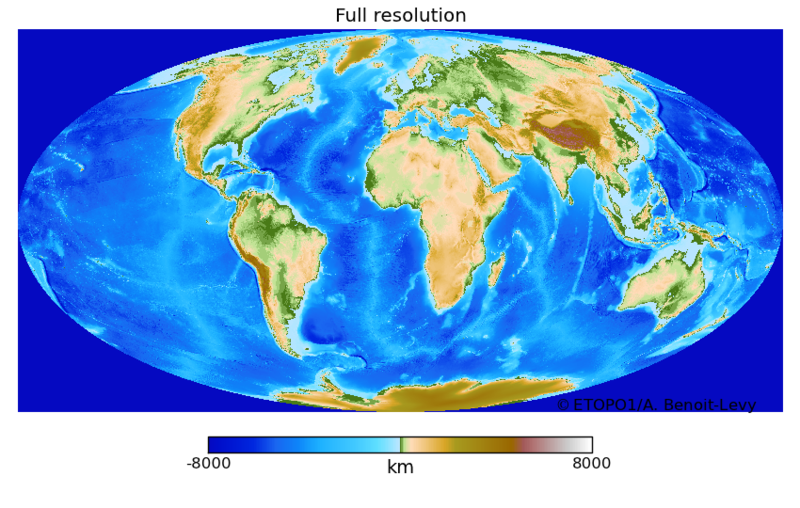 Another interesting fact is that it seems that there’s not much difference between the Planck and WMAP resolutions. That is mostly because the image is too small to be sensitive to such fine resolution, and thus we need to zoom in, in order to see the improvement of Planck compared to WMAP. We can now concentrate on an even more familiar region. 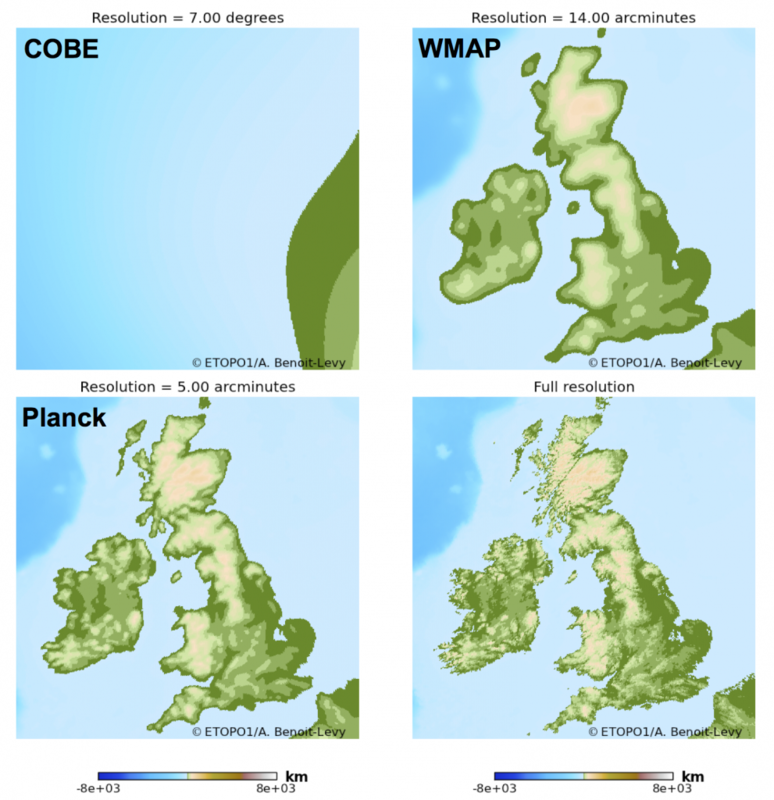 The following figures show how the British Isles would appear as seen by COBE, WMAP, Planck, and the original data. And this comes quite as a surprise: at the COBE resolution, England is totally overpowered by France, and does not seem to exist at all! This might actually be a good thing if harmful aliens were to observe the Earth at COBE resolution before launching an attack: they would not spot England and would strike at France! More seriously, we have seen previously that, at the 7 degree resolution, islands are not yet resolved and are hidden by the high mountains that spread their intensity (in this case their altitude) over large angular distances. However, at WMAP resolution the British Isles are perfectly resolved but everything appears blurred. The situation improves with Planck resolution and then we can see the improvement between WMAP and Planck. Note that even at the Planck resolution, we miss fine details and there is much more information in the original data. That is, however, not the case for the CMB, as physical processes at recombination actually damp the signal at small scales, and Planck indeed extracts all the information in the primary CMB. To conclude this post, the following animation shows the “Rise of the British Isles”. The topographic data is from the ETOPO1 global relief website, and could in principle be found here. Hiranya Peiris talking about what it’s like being a cosmologist, the recent results from the Planck satellite and the interplay between cosmology and the Higgs boson discovery at CERN, as part of a series of interviews for Origins 2013, a European Researcher’s Night event. This blog post was written by Jonathan Frazer. 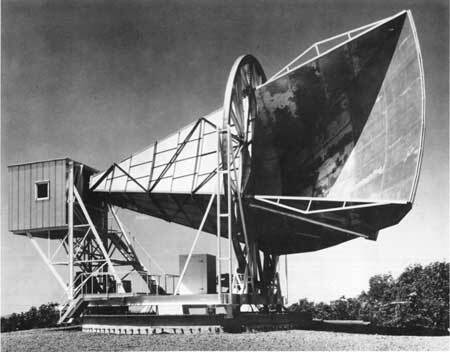 In 1964, Bell Labs built a new antenna which was designed to detect the radio waves bounced from echo balloon satellites, but there was a problem with the antenna. The signal was far less clean than they were expecting. The first theory seeking to explain this signal was the pigeon droppings theory. A pair of pigeons had built a nest in the antenna and so the hypothesis was that by removing these pigeons, the signal would be improved. In general, one of the perks of being a cosmologist is that there are very few ethical issues to worry about. I am sad to say however that in this instance, extreme measures were taken. The pigeons were shot. What is more, they died in vain since the noisy signal persisted. The pigeon droppings theory was ruled out. At this point a new theory became popular. Rather than the unwanted signal being caused by pigeon waste, it was now proposed that the source of contamination could be explained by a controversial theory known as the Big Bang. Largely the result of philosophical bias, for a long time it had been thought that the Universe had always existed, staying much the same for all eternity. This new theory proposed there was in some sense a beginning to our Universe. A particularly nice feature of this theory was that it had a number of striking predictions relating to the fact that soon after the Universe came into existence, it would be very hot and very dense. One of these predictions was that a simple series of cosmic events would take place as the universe expanded, and this would result in radiation that should be observable even today. It was this radiation that caused the problem at Bell Labs. This radiation, often referred to as the cosmic microwave background (CMB) is remarkable in many ways and plays a role of paramount importance in testing both theories of the early universe, and theories of late time structure formation. One important characteristic is that almost nothing has interfered with this radiation since its creation; it is essentially a snapshot of the universe, soon after its birth. This brings me to the problems we face today, and hence also the work I have done in my thesis. There is a beautiful theory of the early universe known as inflation. This theory describes how quantum fluctuations are the seeds that eventually grow to become the complex structures we see today, such as galaxies, stars and even life. In order to test this theory, it is essential that we understand with great precision how these quantum fluctuations will be imprinted in the CMB. A significant part of my work to date has been to develop better methods of doing this. However, testing the theory of inflation has turned out to be rather more challenging than first expected. As I mentioned, the early universe was very hot and very dense which means that any theory of the early universe inevitably involves studying particle physics at energy scales far far greater than anything we could ever hope reproduce in an experiment on Earth. This means we must study particle physics at a more fundamental level. This leads us to string theory! String theory famously suffers from the problem that it is exceedingly difficult to test experimentally. So the prospect that there may be information encoded in the CMB, for many physicists, is very exciting! That said, there is a serious problem. Historically, theories of inflation were very simple and much like the pigeon theory, they were easy to test. Typically there would be only one species of particle that needed to be considered and this would mean it was straightforward to make a prediction. However, again much like the pigeon theory, it seems these theories are too basic and the reality may be significantly more complex. Recent developments in string theory have resulted in inflationary models becoming vastly more complex. Often containing tens if not hundreds of fields which need to be taken into account, this has resulted in a class of models where it is no longer understood how to make predictions. Fortunately there is reason to think this challenge can be overcome. While the underlying structure of this new class of models can be exceedingly complicated, the combined effect of all the messy interactions between these many particles can actually result in a wonderfully simple and consistent behaviour. It is far too soon to say whether or not this result is generic but this emergent simplicity may hold the key to understanding how string theory can finally be tested! Predictions in multifield models of inflation, submitted to JCAP. 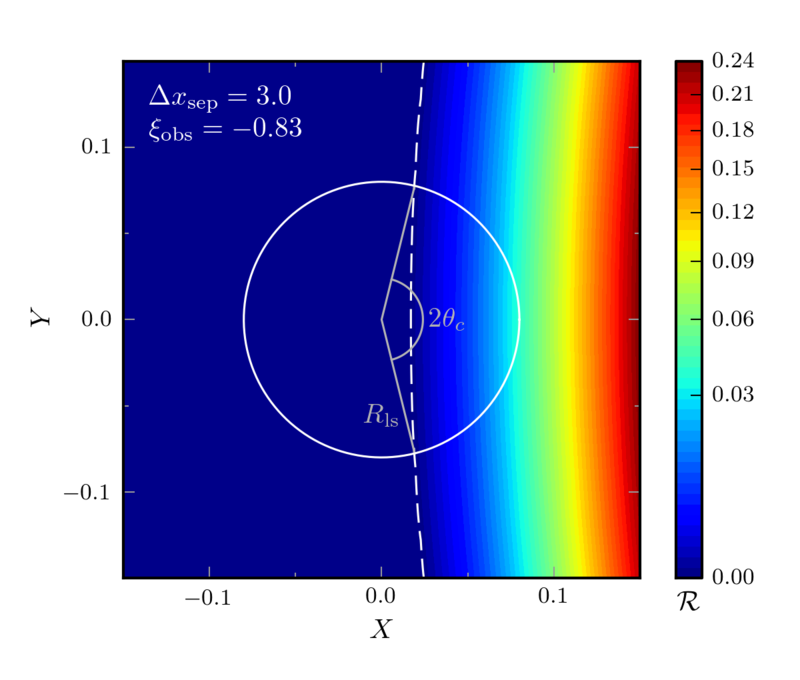 Multifield consequences for D-brane inflation, JCAP06(2012)020. Inflationary perturbation theory is geometrical optics in phase space, JCAP09(2012)010. Multi-field inflation with random potentials: field dimension, feature scale and non-Gaussianity, JCAP02(2012)039. Exploring a string-like landscape, JCAP02(2011)026. The cosmology conference LSS13 on “Theoretical Challenges for the Next Generation of Large-Scale Structure Surveys” took place in the beautiful city of Ascona in Switzerland between June 30 and July 5. It brought together experts in the theory, simulation and data analysis of galaxy surveys for studying the large-scale structure of the universe. Boris attended LSS13 and presented his work on cosmology with quasar surveys. Thanks to good preparation (and a lot of feedback from colleagues at UCL), Boris won the award for the best contribution/presentation from a young researcher! This award not only included a framed certificate, but also a T shirt and a small cash prize! 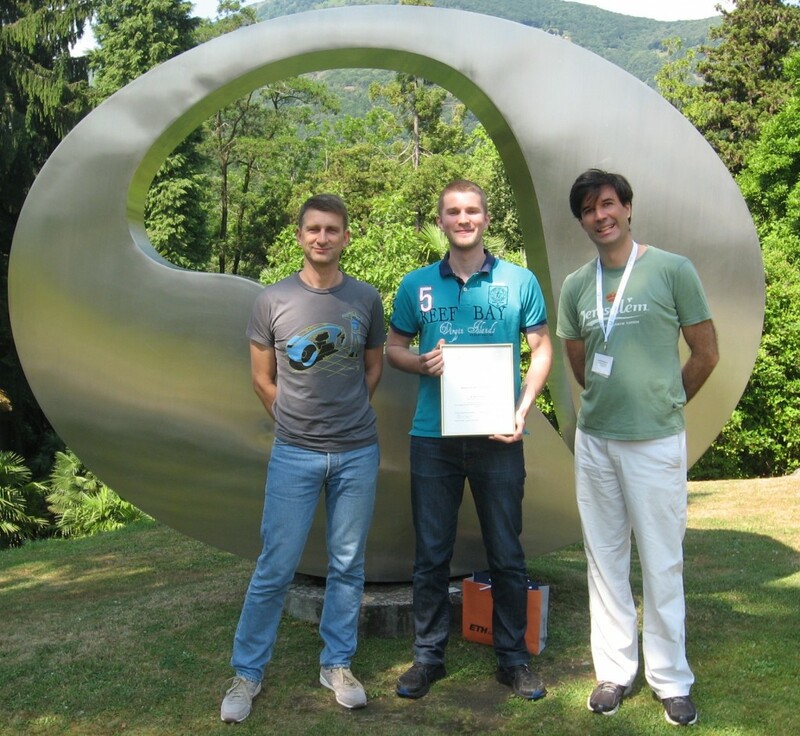 The picture below captures this moment with the organisers of the conference, Professors Uros Seljak and Vincent Desjaques, in front of the sculpture that symbolises the Centro Stefano Franscini in Ascona. Boris and the conference organisers, Professors Uros Seljak (left) and Vincent Desjaques (right), posing in front of the conference center in Ascona. This blog post was written by Boris Leistedt. Devoured from within by supermassive black holes, quasars are among the most energetic and brightest objects in the universe. Their light sometimes travels several billion years before reaching us, and by looking at how they cluster in space, cosmologists are able to test models of the large-scale structure of the universe. However, being compact and distant objects, quasars look like stars and can only be definitively identified using high-resolution spectroscopic instruments. However, due to the time and expense of taking spectra, not all star-like objects can be examined with these instruments, and quasar candidates first need to be identified in a photometric survey and then confirmed or dismissed by taking follow-up spectra. This approach has led to the identification and study of tens of thousands of quasars, greatly enhancing our knowledge of the physics of these extreme objects. Current catalogues of confirmed quasars are too small to study the large-scale structure of the universe at sufficient precision. For this reason, cosmologists use photometric catalogues of quasar candidates in which each object is only characterised by a small set of photometric colours. Star-quasar classification is difficult, yielding catalogues that in fact contain significant fractions of stars. In addition, the unavoidable variations in the calibration of instruments and in the observing conditions over time, create fluctuations in the number and properties of star-like objects detected on the sky. 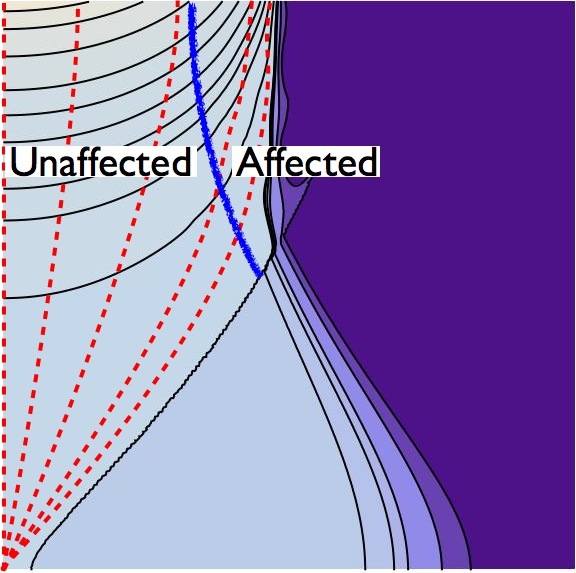 These observational issues combined with stellar contamination result in distortions in the data that can be misinterpreted as anomalies or hints of new physics. In recent work we investigated these issues, and demonstrated techniques to address them. We considered the photometric quasars from the Sloan Digital Sky Survey (SDSS) and selected a subsample of objects where 95% of objects were expected to be actual quasars. We then constructed sky masks to remove the areas of the sky which were the most affected by calibration errors, fluctuations in the observing conditions, and dust in our own Galaxy. We exploited a technique called “mode projection” to obtain robust measurements of the clustering of quasars, and compared them with theoretical predictions. Using this, we found a remarkable agreement between the data and the prediction from the standard model of cosmology. Previous studies of such data argued that they were not suitable for cosmological studies, but we were able to identify a sample of objects that appear clean. In the future, we will use these techniques to analyse future photometric data, for example in the context of the Dark Energy Survey in which UCL is deeply involved. Hiranya Peiris recently gave a talk at TEDxCERN, CERN’s first event under the TEDx program. You can watch her talk, titled The Universe: a Detective Story, here. Enjoy! In my previous post, I mentioned CMB lensing and said that it was going to be a big thing. And indeed, CMB lensing has been presented as one of the main scientific results of the recent data release from the Planck Collaboration. So what is CMB lensing? Put succinctly, CMB lensing is the deflection of CMB photons as they pass clumps of matter on the way from the last scattering surface to our telescopes. These deflections generate a characteristic signature in the CMB that can be used to map out the distribution of all of the matter in our Universe in the direction of each incoming photon. Let me now describe these last few sentences in greater detail. I am sure you are familiar with images of distorted and multiply-imaged galaxies observed around massive galaxy clusters. All of these images are due to the bending of light paths by changes in the distribution of matter, an effect generally known as gravitational lensing. The same thing happens with the CMB: the trajectories of photons coming from the last scattering surface are modified by gradients in the distribution of matter along the way: i.e. the large-scale structure of our Universe. The main effect is that the CMB we observe is sightly modified: the temperature we measure in a certain direction is actually the temperature we would have measured in a slightly different direction if there were no matter in the Universe. These deflections are small — about two arcminutes, or the size of a pixel in the full-resolution Planck map — and can hardly be distinguished by eye. Indeed, if you look at the nice animation by Stephen Feeney, it not possible to say which is the lensed map and which is the unlensed map. But there’s one thing we can see, and that’s that the deflections are not random. If you concentrate on one big spot (either blue or red) you’ll see that it moves coherently in one single direction. The coherence of these arcminute deflections over a few degrees is extremely important as it enables us to estimate a quantity known as the lensing potential: the sum of all the individual deflections experienced by a photon as it travels from the last scattering surface. Although we can only measure the net deflection, rather than the full list of every deflection felt by the photon, the lensing potential still represents the deepest measurement we can have of the matter distribution as it probes the whole history of structure formation! 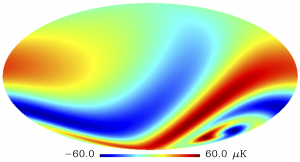 Now, how can we extract this lensing potential from a CMB temperature map? As I mentioned earlier, CMB lensing generates small deflections (a few arcminutes) but correlated on larger scales (a few degrees). This mixing of scales (small and large) results from small non-Gaussianities induced by CMB lensing. More precisely, the CMB temperature and its gradient become correlated, and this correlation is given precisely by the lensing potential. We can therefore measure the correlation between the temperature and the gradient of a CMB map to provide an estimate of the lensing potential. Of course, this operation is not straightforward and there are quite a lot of complications due to the fact that the data are not perfect. But we can model all of these effects, and, as they are largely independent of CMB lensing, they can be easily estimated using simulations and then simply removed from the final results. The Planck lensing potential. 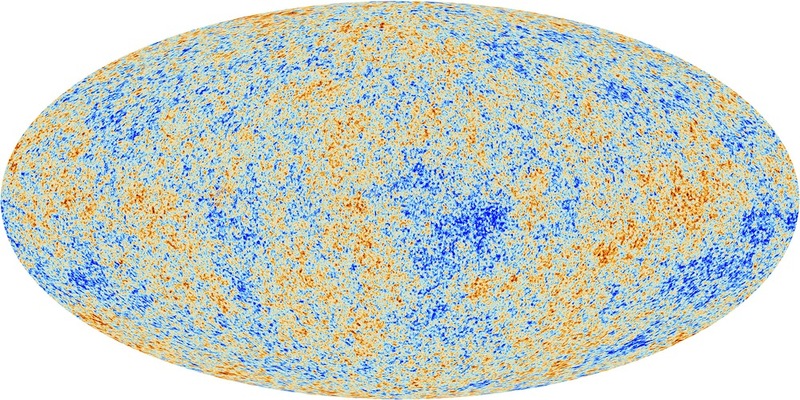 This map can be thought as a the map of the matter in our Universe projected on the sky. This blog post was written by Hiranya Peiris. There was great excitement at EarlyUniverse@UCL this week due to the first cosmology data release from the Planck satellite! Andrew Jaffe has a nice technical guide to the results here, and Phil Plait has a great, very accessible summary here. 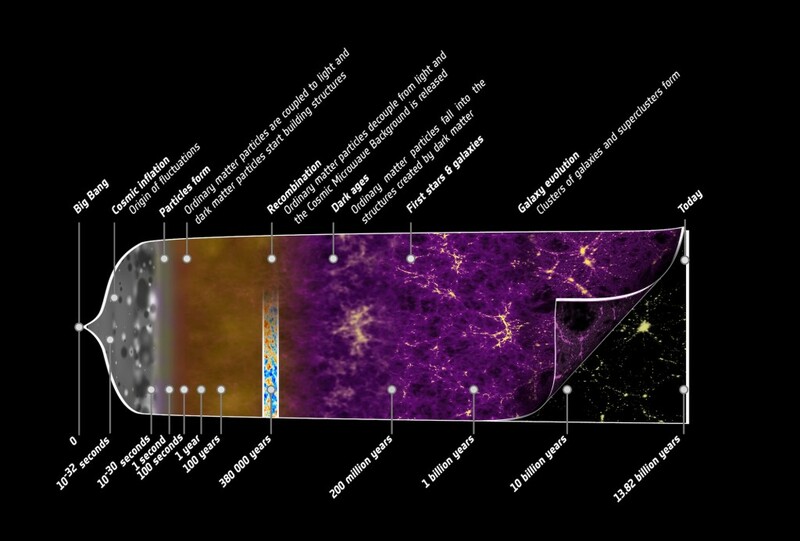 The data and papers are publicly available, and you can explore Planck’s stunning maps of the fossil heat of the Big Bang – the cosmic microwave background (CMB) – on the wonderful Chromoscope. Planck’s results bring us much closer to understanding the origin of structure in the universe, and its subsequent evolution. In the past few months, Jason McEwen, Aurélien Benoit-Lévy and I have been working extremely hard on the Planck analyses studying the implications of the data for a range of cosmological physics. Now we can finally talk publicly about this work, and in coming weeks we will be blogging about these topics; but in the meantime the technical papers are linked below! The Planck results received wide media coverage, including the BBC, The Guardian, the Financial Times, the Economist, etc. 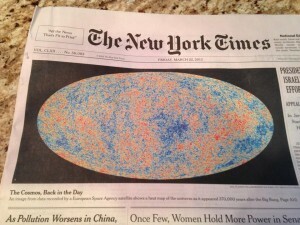 But as a former part-time New Yorker, the most thrilling moment of the media circus for me was seeing Planck’s CMB map taking up most of the space above the fold, on the front page of the New York Times! This guest blog post was written by Aurélien Benoit-Lévy. The cosmic microwave background (CMB) is the furthest light we can observe. Since it is the furthest, bright galaxies and other compact objects can pollute in a nasty way the superb observations of the CMB that forthcoming experiments will soon deliver. To get rid of these point sources, we need to mask them. This is of course not harmless, as the resulting map is punched with holes just like emmental! Holes in a map are unfortunate as they considerably complicate the spectral properties of the signal under consideration. But if there is a problem somewhere, it means that there is a solution, and I’m sure you would have guessed the solution: inpainting! Inpainting is just like cod, it’s good when it’s well made. The basic idea is to fill the holes with some fake data that would mimic some properties of the original signal. There are plenty of methods to inpaint a hole. For instance, the simplest one would be to fill the hole with the mean of all the surrounding pixels, but we can do much better than that. CMB has a nice property: it’s correlated. This means that the probability that a given pixel has a given value is not independent of the value of the other pixels. And the CMB is also (very very close to) Gaussian, so we can use those two properties to generate random constrained Gaussian realizations that mimic the lost signal, but preserve the statistical structure of the map. Basically, we can use the information contained in the non-contaminated region to guess the most probable value in the holes. This technique has been known for quite a while, but sometimes requires heavy computations to accurately take into account all the information available in the map. In recent work, my collaborators and I have demonstrated that it is not necessary to account for the whole map to inpaint a small hole. Using only the neighboring pixels is enough. With this method, we are able to inpaint a realistic CMB map, with a realistic point source mask in a realistic time! And the statistical properties of the inpainted maps are virtually unchanged! We applied this locally-constrained Gaussian realization in the special case of CMB lensing reconstruction and showed that this tool is very efficient, as it preserves the two-point statistic, and – above all – does not generate a spurious four-point signal. Of course, I now need to tell you about CMB lensing and four-point statistics, which is a very big thing and we’ll hear a lot about it in the coming months. But that will be for another post! 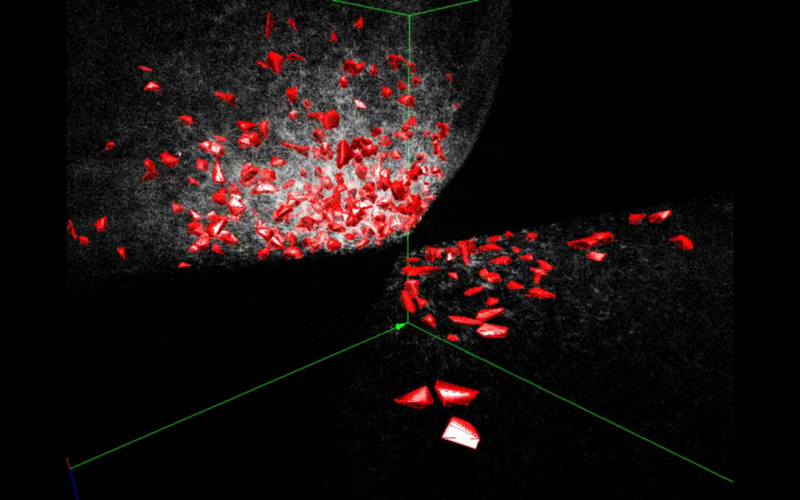 Full-sky CMB lensing reconstruction in the presence of sky-cuts. Neutrinos are puzzling little particles. The Standard Model of particle physics tells us that there are three different types, or “flavours”, of neutrinos, each of which has no mass. Particle physics experiments, however, tell a different story. Firstly, the fact that neutrinos produced in the Sun (and nuclear reactors) are observed to oscillate between flavours requires them to have mass. Furthermore, unexpected results corroborated by a number of experiments measuring the rate of oscillations hint at the existence of more than three neutrino flavours. This is all very interesting, and it seems that the Standard Model is ripe for revision, but what has it got to do with cosmology? Quite a lot, as it happens! Neutrinos, along with all fundamental particles, are produced in the early Universe. As they are so light, the neutrinos are extremely relativistic, and hence very energetic: so much so that, along with the photons, they dominate the dynamics of the early Universe. If there are four neutrinos rather than the standard three, the Universe initially expands more quickly than the current cosmological model (LambdaCDM) predicts, and cold dark matter becomes important at later times. Furthermore, neutrinos are so energetic that they are able to escape from the density perturbations set up in the early Universe — they “free-stream” a certain distance which is dependent on their mass — and hence affect the amount of structure that forms. All of this has observable consequences for cosmology, affecting the relative amounts of simple elements produced in the Universe’s first few minutes, the amplitude and scale of the oscillations in the cosmic microwave background (CMB), and the numbers of, for example, galaxy clusters. We can therefore try to determine the number of neutrino species and their masses from cosmology! In fact, the strength of the effects of neutrinos in the early Universe, coupled with the quality of cosmological data, means that cosmological tests of neutrino physics are more powerful than laboratory experiments. That’s what we (Hiranya, Licia Verde and I) have been doing. People have, of course, already started looking for hints of non-standard neutrinos in cosmology, and have found weak indications that the most likely number of neutrino species is greater than three. These analyses have, however, relied on parameter estimates: finding the most likely number of neutrino species given the data, and claiming evidence of new physics if this is not the standard value. What we really want to do is to determine the support for a model with, for example, extra neutrinos, and compare this to the support for the standard cosmological model. This is what we’ve done: we have used the Bayesian evidence to compare the relative probabilities of LambdaCDM and models with extra neutrino flavours and massive neutrinos, given cosmological data. The datasets we consider include CMB power spectra from WMAP and the South Pole Telescope, measurements of the Universe’s recent expansion, and measurements of the weak gravitational lensing of the CMB by intervening large-scale structure. Our model-selection results indicate that the standard cosmological model is favoured over models with additional neutrinos and/or neutrino mass. There is therefore no requirement from cosmology to change our view of the neutrino. We’re going to need better cosmological data — such as the Planck data coming in a couple of months’ time — to make progress on this problem. The lensing of the CMB by intervening matter: a promising cosmological probe of neutrino properties. Is there evidence for additional neutrino species from cosmology? JCAP, submitted, 2013. Paul Sutter is visiting UCL this week to collaborate on the detection and cosmological uses of cosmic voids using wavelet methods. 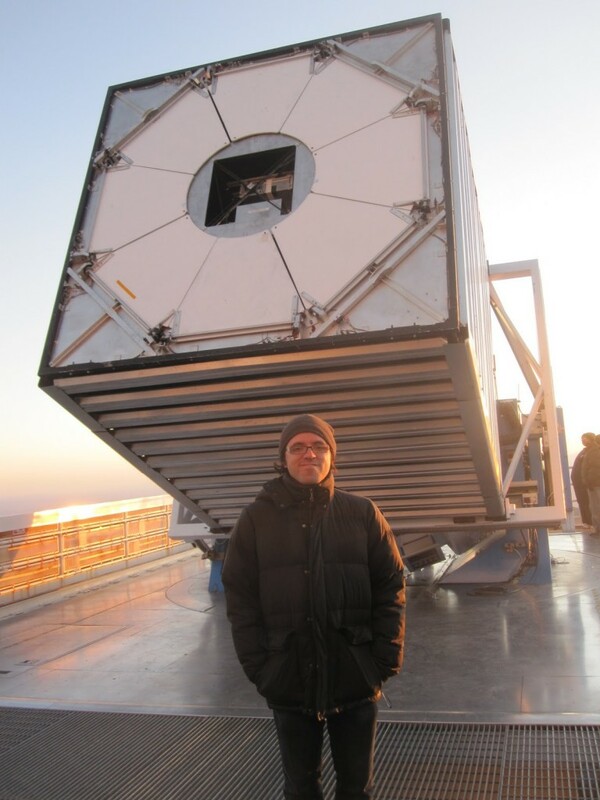 He kindly wrote a guest blog for EarlyUniverse@UCL. Voids are all the large, empty spaces in the Universe. Until recently they have been mostly ignored as astronomers focused on all the bright, hot, and glowy stuff out there: stars, galaxies, and clusters. And we can’t really blame the astronomers: stars, galaxies, and clusters are easy to spot, easy to collect information from, have rich dynamics…in other words, they’re interesting. Voids, on the other hand, are hard to identify, hard to collect information from, and have relatively uninteresting dynamics. In fact, they are so boring that their structure and evolution pretty much echoes the early universe with very little modification. This yields a surprising result: if we can reliably identify voids, then we have an almost perfectly clear window into the early universe and the nature of dark energy! Galaxy surveys such as the Sloan Digital Sky Survey are mapping large volumes of the Universe, revealing many structures large and small, including cosmic voids. Working with Ben Wandelt and Guilhem Lavaux, I’ve adapted a void finder to work with real observational data. 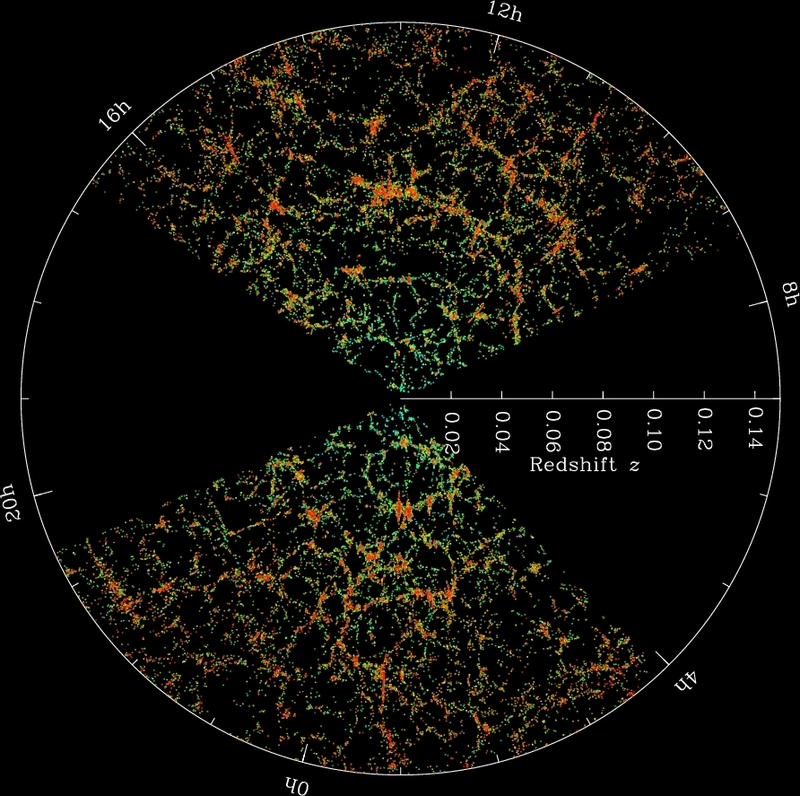 The figure shows the distribution of medium-sized voids in our nearby universe. In the figure, the points are individual galaxies. With the additional help of David Weinberg, I’ve developed a public catalog of these voids. This catalog is accelerating many kinds of innovative void-based science. More information can be found at cosmicvoids.net and pmsutter.com. Voids in the SDSS. Copyright Paul Sutter. Jason McEwen recently gave a talk at CALIM 2012 (CALibration and IMaging for the SKA) on the application of compressive sensing techniques to imaging for radio interferometry. You can watch his talk here. Enjoy! Stephen Feeney passed his PhD viva on Nov 15th! His thesis is entitled “Novel Algorithms for Early Universe Cosmology”. Congratulations to Dr Feeney! The newly minted Dr Feeney, with the supporting cast (left to right) of Boris Leistedt, Filipe Abdalla, Jason McEwen, and Hiranya Peiris. We have two categories: best geek homage and best teeth. Entries were received from Hiranya and Boris. 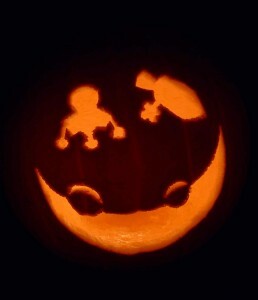 Hiranya’s entry: “Ghostly moon landing” in honour of Neil Armstrong. Boris’ entry: “Miam miam”, which according to Boris translates as “yum yum”. In the best geek homage category, Boris’ entry comes a respectable 3rd and the grand prize goes to… Hiranya! 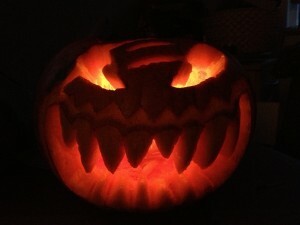 In the best teeth category, Hiranya’s entry comes a respectable 3rd and the grand prize goes to… Boris! Surprisingly, it’s almost as if the participants tailored their entries to each category! In any case, it turns out everyone’s a winner! Yay! 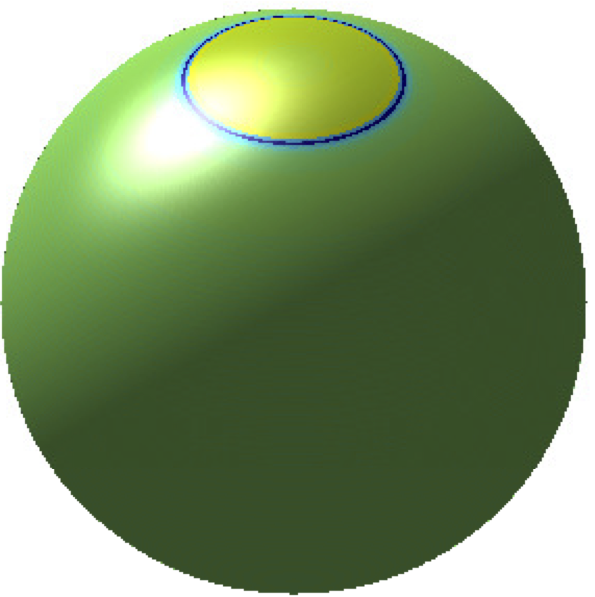 Last May, Boris Leistedt and Jason McEwen finished developing the first exact harmonic and wavelet transforms in 3D spherical coordinates. The paper has now been peer-reviewed and will be published in IEEE Trans. Sig. Proc. in December. The code is available on www.flaglets.org. Why exact? Exact transforms are essential in information sciences because they enable one to capture all the information contained in a complex signal, and process it without any loss of information. Thanks to this theoretical property, the accuracy achieved by the transform is only limited by the representation of floating-point numbers on the computer! Why wavelets? Wavelet transforms are increasingly successful in various disciplines (including astrophysics and geophysics) because they separate scale-dependent, localised features in the signals of interest, which is very suited to the extraction of patterns in complex data. As an example they were used by Stephen Feeney and Hiranya Peiris to search for potential signatures of topological defects in the cosmic microwave background. Why in three dimensions? In astrophysics, spherical wavelets are naturally suited to the analysis of signals on the sky, and cosmologists have already started to apply them to galaxy surveys, for instance to help dealing with the systematics or to isolate structures at different physical scales of interest. 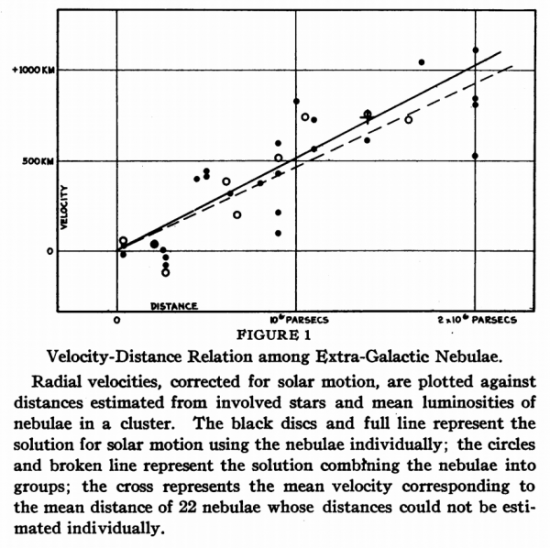 However galaxy surveys are 3D datasets where the angular position is accurately measured on the sky but the radial information (such as photometric redshift or distance) is often estimated from color information and therefore subject to uncertainty. Not only one should use 3D wavelets to properly treat such data, but these wavelets should furthermore separate the radial and angular features to avoid mixing of radial and tangential systematic uncertainties. The accuracy would also be critical because most modern pipelines apply these transforms repeatedly (to go back and forth from pixel to wavelet space), leading to a loss of information if the transform is not exact. What is the outcome? To address these problems, Boris and Jason designed a 3D harmonic transform combined with a sampling theorem on the ball, namely a 3D pixelization scheme that captures all the harmonic information in a finite set of samples on the ball. Then, they defined wavelet kernels, called “flaglets”, to extract scale-dependent, localised features in signals defined on the ball. The flaglets isolate patterns in the radial and angular dimensions separately and are very promising for analysing galaxy surveys and treating their systematics. The code is fast, accurate, and is publicly available on www.flaglets.org. 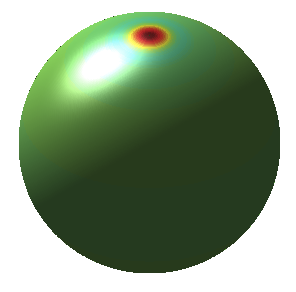 Exact Wavelets on the Ball, IEEE Trans. Sig. Proc., 60 (2012). 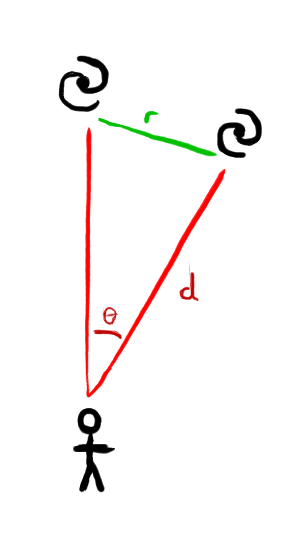 Flaglet transform of a N-body simulation. The top left signal is the input data, and the following signals are the flaglets. Click on the image to see larger version. Wavelets are a powerful signal analysis tool due to their ability to localise signal content in scale and position simultaneously. The generic nature of wavelets means that they are suitable for many problems, but by the same token, for certain problems they are not necessarily optimal. In some instances, where we have a good prior knowledge of the signal we are interested in, we can create an optimal filter to look for it. When looking for the signatures of bubble collisions in cosmic microwave background (CMB) observations, we have a good theoretical prediction of the expected form of the signal. To detect likely bubble collisions candidates in the CMB, we developed a source detection algorithm using optimal filters. Since the bubble collision signatures that we expect to see in the CMB vary with size and position on the sky, wavelets are a powerful method for the candidate source detection, and indeed have been shown to work very well. However, since we have a good prediction of the bubble collision signature, we can exploit this knowledge by constructing optimal filters that are matched to the expected signal, and also to the background stochastic process in which the signal is embedded (in this case CMB fluctuations). The optimal filters can thus look quite different to the wavelets that would be used for the same purpose (see plots). The image below shows the signal-to-noise ratio (SNR) achieved by wavelets and optimal filters for detecting bubble collisions in the CMB. We see that optimal filters outperform wavelets since they are closely adapted to the profile of both the bubble collision signature and also the background stochastic process (the CMB). For the detection of cosmic bubble collisions, optimal filters allow us to exploit our knowledge of the expected signal. However, wavelets are suitable for a wider class of problems. As always, the best analysis technique to adopt depends heavily on the problem at hand.